A couple weeks ago, we shared a sneak peek of a recent trip to the Eames House, also known as Case Study House #8. We stopped to look at the Pacific Standard Time exhibit, Indoor Ecologies: The Evolution of the Eames House Living Room and, of course, to visit one of the most well-known homes in the discussion of mid-century modernism. 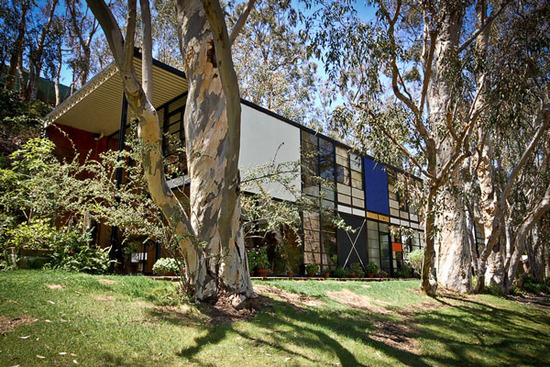 The relatively small exterior exhibit featured several panels of images and quotations that highlight the construction of the house in 1949 and the Eames' innovative and experimental approach to design, as exemplified in the evolution of their own living room. A detail of one of the panels is shown below. 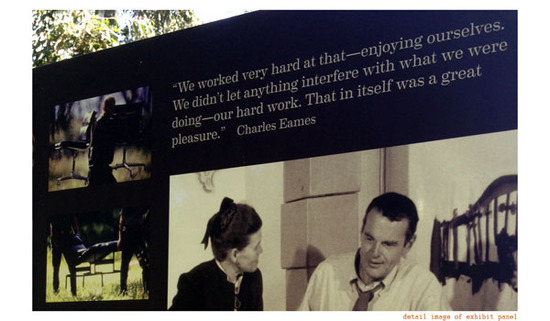 For more information, visit the Eames House Foundation.